Trace your cat's ways and find out how far it walked, where it got food and where it spent the night. 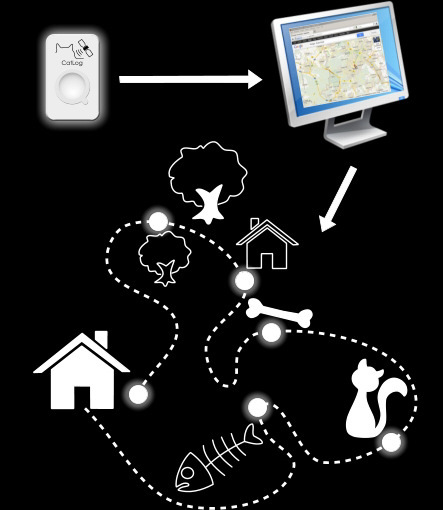 In conjunction with the CatCam the ultimate tool to get in touch with you pets life. This amazing tiny device carries a lot of high technology inside. The small size and low weight may lead you to an other conclusion, but the device contains a high sensitive GPS Receiver, rechargeable battery, memory for position storage and USB interface. A waterproof enclosure allows the use in any weather/environmental condition. The device supports automatic position logging. The interval time can be adjusted in a wide range. Captured position data is displayed on a Google map after downloaded from the device. First, the CatLog is configured on your computer. After this the small device is attached on the neck of the pet using a harness. 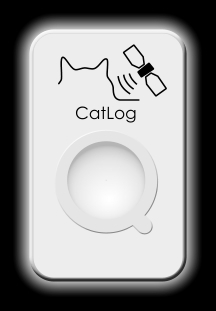 The CatLog receives the signals of multiple GPS satellites and records it's momentary position. This works even in the forest or in urban canyons because of the high sensitivity of the receiver. 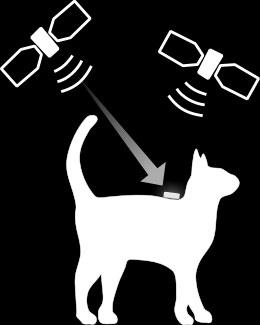 After the pet returns the recorded position data is transferred to your computer. This is done by means of the USB interface. Because the device is hermetically sealed it is connected using a special USB cable. The device battery is charged in parallel to the data transfer. With the integrated Google Maps it is possible to display the recorded journey on a map. By overlaying satellite images it gets easily visible where the pet roamed. The Google Maps satellite images usually have a high resolution so that houses, backyards and trees visible. Together with the position also the time is recorded. This allows to play back the whole journey.